Synopsis: The next evolution of the Marvel Cinematic Universe brings a founding member of The Avengers to the big screen for the first time with Marvel Studios’ Ant-Man. Armed with the astonishing ability to shrink in scale but increase in strength, master thief Scott Lang must embrace his inner hero and help his mentor, Dr. Hank Pym, protect the secret behind his spectacular Ant-Man suit from a new generation of towering threats. Against seemingly insurmountable obstacles, Pym and Lang must plan and pull off a heist that will save the world. Now that the Marvel stable includes a wide array of heroes and numerous successful film franchises, most are waiting for the studio’s first true flop. Some had thought that the very weird Guardians of the Galaxy might be that underperformer, but James Gunn and Co. proved that with the right cast and story even the weird Marvel properties could thrive. But still, everyone is waiting for the Marvel brand to falter, and now their focus is trained on Ant-Man and whether or not the Paul Rudd-led hero flick can defy the odds yet again. While we can’t speak to the box office performance of Ant-Man just yet, it’s fair to say that Marvel’s latest is certainly of a middling quality. Its superhero fare that hits all the right notes and delivers all the essential set pieces, but it doesn’t have the unique quality that films like Guardians of the Galaxy or Captain America did. Ant-Man is a lot like Iron Man, without the endlessly charming Robert Downey Jr. to bolster its weaker parts. 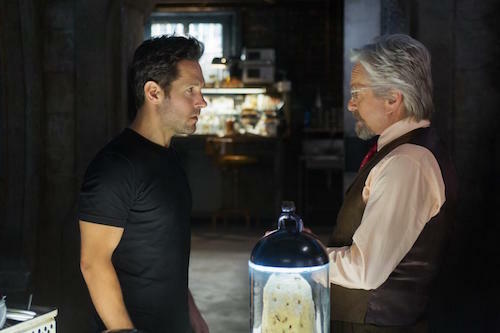 For those who might not be familiar, and odds are there are many, Ant-Man tells the story of Scott Lang (This is 40‘s Paul Rudd), a skilled cat burglar with a deft hand and a noble heart. He’s been in and out of jail numerous times, all while trying to be some sort of figure in his daughter Cassie’s life. Hank Pym (Beyond The Reach‘s Michael Douglas) sees that Scott wants to do right by his daughter and decides to give him a shot at redemption. 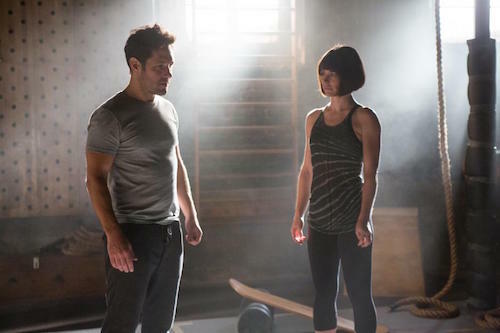 He bequeaths Scott with the Ant-Man suit: A superhero costume capable of shrinking its wearer down to the size of an insect, while preserving their strength and agility as if they are a tiny bullet. It’s a bit absurd, even more so once Hank teaches Scott how to communicate with ants, but by and large the Ant-Man concept works. It affords some easy laughs and supports action that feels new and inventive. Watching Scott switch from big to small can occasionally be hard to follow, as the photography quickly switches focal lengths, but it never feels like old hat. Watching Scott truly become Ant-Man calls to mind the final scenes in Iron Man, when Tony Stark gets to let his inner superhero out. The character work in Ant-Man is equally solid, with all the major cast members turning in enjoyable performances. Rudd is appropriately charming, yet sarcastic, as a hero named Ant-Man should be. Michael Douglas’ Hank Pym is the wise advisor with a dry sense of humor. And Evangeline Lilly’s Hope is a suitable love interest/trainer. Truthfully, the only actor that doesn’t get a fair shake is Corey Stoll’s (Non-Stop) pointlessly maniacal Darren Cross. His heel turn is motivated not by character but by plot necessity, and as a result Cross’ character feels like a waste. We never truly get to see Cross as anything but a power-hungry businessman. He’s neither dynamic nor is he ever likeable, and his sole purpose is to don his own shrinking suit to fight Ant-Man. In the end, Ant-Man is neither bad nor great. It’s a Marvel blockbuster that’s plenty enjoyable but doesn’t have the same spark that bursts through the studio’s biggest hits. The cast is likeable for the most part, the action is fun (what little there is of it), and the comedy strikes a unique tone for Marvel. But a very boring/generic first act and a predictable villain weigh the film down significantly. Ant-Man is a middle-of-the-road Marvel film, but that’s still better than most blockbusters out there. For the first time in a Marvel film, the main character’s super powers have opened up opportunities for action that feels unlike anything we’ve seen before. 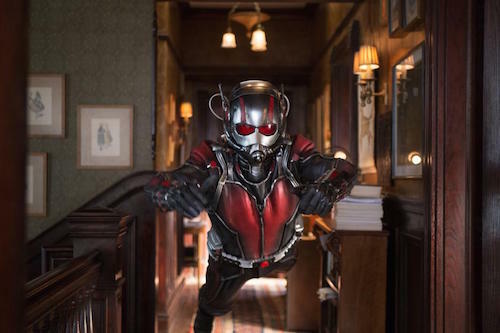 As Ant-Man transitions from full size to bite size, the action and photography will occasionally transition to match. It’s a bit jarring at first, but once you get used it, the action starts to pop in some unexpected ways. When Ant-Man is small, for example, the focal length is really shallow, which helps give the scenes a true sense of scale. And when he’s large, the action either shows Ant-Man in full costume fighting normally or it shows full size thugs reacting to miniature, but devastating, punches. It’s both absurd and really cool to see on-screen and feels unlike anything you’ve seen before. While the remaining Marvel movies are trying to continuously outdo each other with larger and larger scale set pieces, Ant-Man finds a nice home in the small scale, and it really works. Since the Ant-Man script has undergone a few re-writes it’s hard to give credit for one particular element to either former director Edgar Wright, star Paul Rudd, screenwriter Joe Cornish (Attack The Block), or screenwriter Adam McKay (The Other Guys) without shunning the others as they all share writing credit. But whoever is responsible for the dry comedy in Ant-Man deserves a round of applause for a script that subverts expectation in all of the film’s most cliche moments. Granted, it does take some time for Ant-Man to find its legs tonally, but once the film settles into the idea that audiences shouldn’t take the concept too seriously, it becomes a lot of fun. More importantly, the film never goes for the cheap or obvious laugh, but tries to keep the audience guessing and laughing the whole way through. It’s not the funniest of Marvel’s movies, but Ant-Man‘s humor is unique enough that it doesn’t feel like a rehash.